Arrows are a pivotal part of any archers kit. After all, without arrows you are just a man (or woman) with a bow! So if you are in need of ammunition to nock on your bowstring, you have come to the right place because Medieval Archery has many different styles of traditional arrows. And we offer as many different styles as possible because we know that one style of arrow does not fit all styles of archers. Some archers may prefer to shoot with wooden arrows, to give them a more traditional look and feel. Other archers might prefer carbon arrows for their overall resilience and reliability. 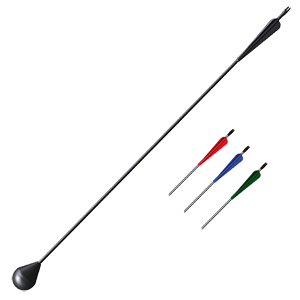 And if you are LARPing, you certainly do not want broad heads or traditional arrows, but instead will seek out our selection of LARP approved arrows. And of course, some archers like the do-it-yourself route, and so we also offer arrowheads that allow them to do just that. Just like with the bow, the arrow is all about preference, so take your time when you browse through our selection of traditional arrows to make sure you select the right arrows for you. And once you find that perfect projectile, whether it is a flu-flu arrow, a cedar arrow, an English arrow, a carbon shaft arrow, a broad point arrow, a bodkin arrow, or anything else, you can bet that you will get it here at Medieval Archery for a great price. As the business end of the arrow, an arrow head is an integral part of archery. After all, without one an arrow is just either a pointy or a blunt stick! Medieval Archery carries a wide range of different arrowhead styles, ranging from classic to highly stylized and specialized, so that whether you are collecting or making your own arrows, you can get just what you want, right when you want it. Whether you are looking for historical arrowheads like bodkin points or broadheads, or seeking something more unique and special like spiral-tipped drill arrowheads, you can find them all here. 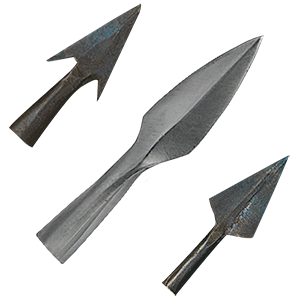 Our selection of arrowheads includes historic types from throughout the ages, as used by warriors, serfs, barbarians, and natives for tasks ranging from war to hunting and more, as well as some more streamlined and modern styles that possess a timeless look and effectiveness to suit the modern-day archer perfectly. And all are made from varying grades of quality steel to ensure that they are not only authentic looking but also effective when mounted on a shaft. Arrow heads from Medieval Archery are a great start for an arrow-making project, and they also make for great collectibles and gifts that any archery enthusiast is bound to enjoy. Some archers prefer carbon arrows over the traditional wood for a variety of reasons. That is why at Medieval Archery, we offer a selection of carbon arrows too, so that when you take up your bow, you can have the arrows that meet your preference. 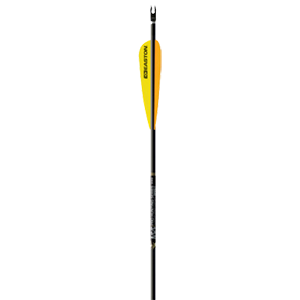 And best of all, our carbon arrows are offered in a variety of different looks and patterns to suit your taste, your need, and your overall style! This ensures that even if you are shooting with carbon arrows, others may not notice thanks to a cleverly chosen pattern. Just like with wood arrows, carbon arrows have their own qualities that set them apart from their wooden cousins. One of the biggest advantages of a carbon arrow is durability, as they are not prone to easy breaking when fired. This makes them the perfect choice for the traditional archer who needs some durable arrows for practice, or for the everyday archer who just wants some good all-around target arrows that can be fired down-range without a worry or care. For the archer who prefers to shoot carbon as opposed to wood, Medieval Archery is still your one-stop-shop, thanks to wide selection of differently patterned and styled carbon arrows. Just like in the medieval era, archery can be a rather rewarding endeavor when used during a Live Action Roleplay. So for all you archers who want to take your bow to the field of battle and safely use it for your next LARP, Medieval Archery has you covered. Fired from a LARP-approved bow, these LARP arrows offer a safe archery experience for your next roleplay battle. These arrows are made from top quality materials utilizing silicone layering and foam padding to ensure that each arrow offers the perfect blend of impact and cushion. The result is that when shot, targets will know that they were hit without any negative consequences - aside from potentially being out of the game. The arrows are also very durable, being made mostly with fiberglass shafts, to ensure that they do not bend, warp, or break even during your longest gaming sessions. 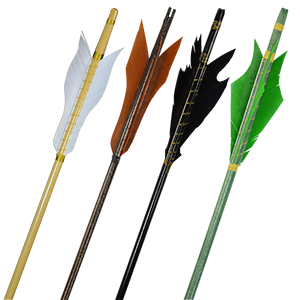 And since they are offered in different colors as well, it is easy to tell which arrows are your LARP arrows! Put your long hours of practice at the target range to use in your next LARP - gear up with some LARP arrows, get an approved LARP bow, and teach your fellow LARPers the danger of a skilled archer today! An archer looking for that tried and true medieval experience with their longbow will want wood arrows. Not only do they complete the look of a historic archer perfectly, but they are also offered in various designs. This ensures that if you have a theme or style to your archer look, Medieval Archery can help you maintain it while giving you the perfect arrow to use. Our arrows are made from a variety of quality woods, including Birch, Poplar, and Port Orford Cedar. Each wood brings its own qualities to the arrow, and every arrow is specially selected and hand crafted so that each grouping is similarly spined and weighted to deliver dependable performance. No matter what style you get our wood arrows are a solid choice and will serve their owner well as reenactment arrows, target arrows, and hunting arrows. And if you are looking for something with a bit more imagination, we also carry a selection of wooden fantasy arrows that will complement an elven archer or a Lord of the Rings bow with ease too! If you have a longbow and you want an authentic and historic experience, then Medieval Archery has the traditional wood arrows that you need to remain authentic in your historic archery experience.